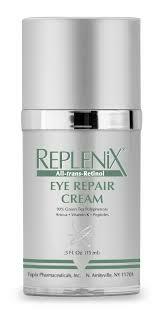 The Replenix All-trans-Retinol eye repair cream is an innovative product that can help increase moisture, reduce the appearance of fine lines and wrinkles, dark circles, puffiness. and increase firmness and elasticity around the eyes. It contains All-trans-Retinol, the powerful antioxidant Green Tea Polyphenols, Dipeptide VW, Emblica, and Vitamin K to help restore the texture and reduce dark circles around your eyes.